If past generations of brides knew whatthe variety of colored wedding dresses to their descendants, they probably never would have not believed. However, over time, changing tastes, views, trends, and also wedding fashion does not stand still. Therefore, modern girls have the opportunity to choose not only white, but also colored wedding dress for his own wedding, it's not even considering the styles of wedding dresses. It is proved that a symbol of chastity and girlish tenderness can be not only white! Increasingly, modern wedding fashion departs fromestablished tradition of white wedding toilet, preferring the color options. Some colors are more popular, while others - less. However, as a rule, it all depends on the preferences of the culprit celebration, its tastes, the overall concept of the wedding. Sometimes, the only important thing to emphasize the color components, for example, a color ribbon or trim, and sometimes the bride chooses a monochrome pastel evening dress. 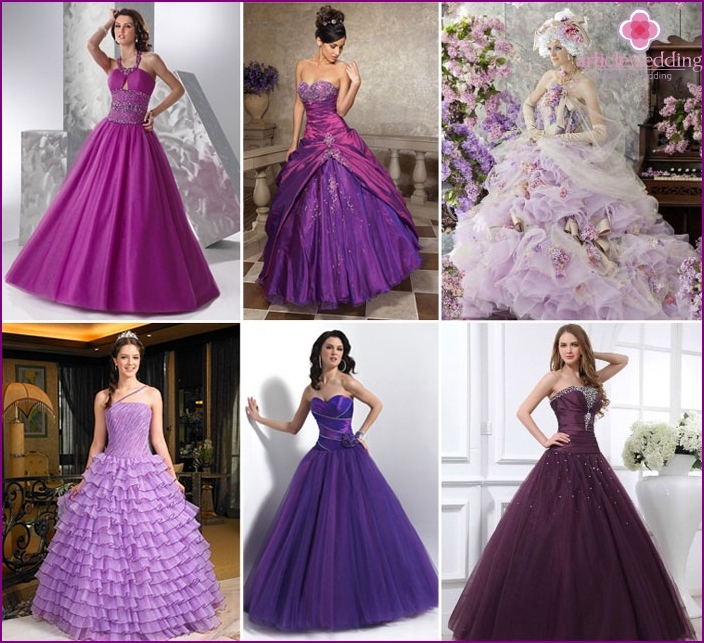 Let us consider in more detail the colored wedding dresses. Blue - the color of devotion, faithfulness, whichsynonymous with ease, freedom and serenity. 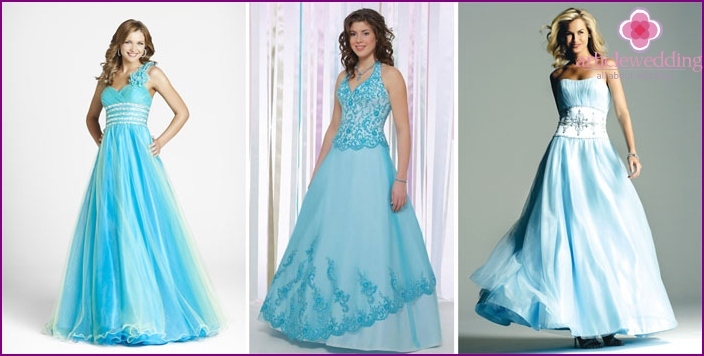 The image of the bride will be gentle if she wears a blue wedding dress on the day of his wedding. Such a choice would be perfect if your festive season painting - hot summers, because anyone who looks at you, it would seem that the heavenly bride exudes cool, invigorating freshness and purity. Among blue shades you will find incredibly beautiful exotic colors, better known as frosty, mint, bright turquoise, azure, heaven. Dreamy pink hue - one of the most popularFlowers among the majority of the newlyweds. Girls tend to emphasize their beauty fragile girlish way that creates this tone. If your skin tsvetotip refers to a dark, then pale pink, pastel or peach tone fabric capable profitable to emphasize the dignity of your appearance. This option is good for those girls whoprefer not to experiment with the color of the wedding dress, so as not to deviate from the chaste image of the bride. Among the range of pink wedding dresses you will find a considerable range of interesting options, such as pastel pink tones, orange-pink, peach, bright pink, coral, etc. If you are madly in love spring, then green forcolor your wedding dress is a great choice. This color is considered to be a symbol of prosperity and well-being, it can completely break all the stereotypes of what should be the image of the bride. Think about what shade of green you will like: a bright emerald green, pastel pistachio, delicate salad or a juicy color of grass. Posheyte bridal suite in the colorscheme, using the Greek style with flying, airy, breathable fabrics (chiffon, silk). Such an image will look great on the full of girls, delicately hiding all figure flaws. This style is ideal for pregnant brides, symbolizing the beginning of the birth of a new family, a new life. 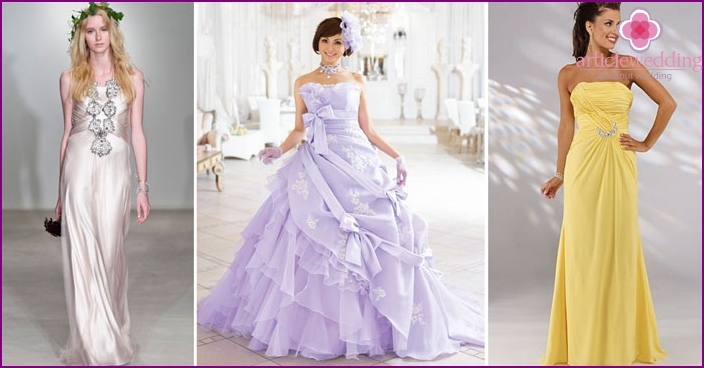 Another fashionable shade wedding decorationIt considered a lilac color. You may wonder how this can be varied hue, playing beautifully in the sunlight. If you - the burning brunette, then a range of profitable emphasize your bright appearance. Lilac tone will look at you generously, creating a mysterious and unforgettable image. It goes well with white snow in winter, so the pictures you will receive after the photo shoot, will take you to a separate aesthetic pleasure from such a masterpiece attire. If your choice fell on the purple weddingtoilet, then you obviously seductive personality, extravagant, with a subtle hint of fragility and tenderness in nature. This shade represents the secret desires, love, femininity. To look perfect, choose the original styles with lush skirts of feathers with ombre effect or elegant skinny silhouette "Fish" with an open bodice strapless. On the wedding day, arrange a photo session for an unforgettable wedding couple at sunset - and you will see how beautiful purple dress plays in the reddish light of the setting sun. 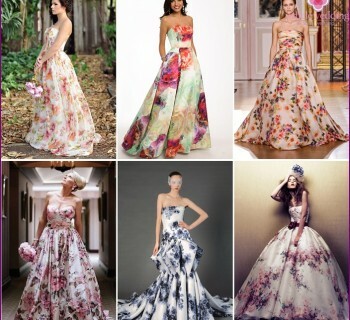 Colored wedding dresses do not have tobe monotonic. You can successfully combine a traditional white wedding decoration with various elements of other colors, such as: color belt with a bow, insert, trim, etc. There are a lot of interesting ideas on how to easily and elegantly to beat an ordinary white wedding decorations additional original color. Colored ribbons often emphasize the waistthe white bride's dress or lace corset. This dress element can have long tails that are beautifully laid out on a flowing loop bridal toilet. Ribbon of the same color can be decorated with a bouquet or a girl hairstyle. This very concise idea is capable to give your image a sophisticated style that attracts attention to detail. Looks nice white dress of the bride finishedcolored lace. This image from the extraordinary looks and gentle at the same time. Sometimes transformers are used insert (removable part) from completely different in texture, color, fabric. Such elements designers love to decorate the bottom of the dress (forming the edge of a different color), bodice, sleeves or use trail in contrasting colors. Also, expressive look at the background of the traditional wedding dress color fabric flowers all sorts of other colors (they can be small or huge size to the entire skirt). In order to highlight the wasp waist of the bride,It became fashionable to wear a wedding dress with a colored sash. It additionally gives a slightly austere style image of the bride, emphasizing all the advantages of her figure. Choosing a color belt can be absolutely diverse - from delicate peach or lavender to unexpected black or brown. This item is used not only forprovide additional beauty bride together, it helps to fit into the overall theme of the wedding, matching its color concept. Often colored belt is used as a separate accessory, so it can be easily removed, immediately returning you to the monotonous white image of the bride. The following at least the original versionthe usual wedding toilet - is colored ribbons on a white background dress. They can be used in the singular, decorating their huge size skirt bride's attire, as well as in numerous variants, being randomly scattered throughout the decoration. Magnificent colored bow looks good from the back, if it is correct to tie at the waist: release all the way down, so that they hung down on the train of the bride. Laconic color small bow atmiddle waist style fans prefer Tiffany and Audrey Hepburn. This great idea is intended to create a retro image and return to the romantic 50s - 60s. 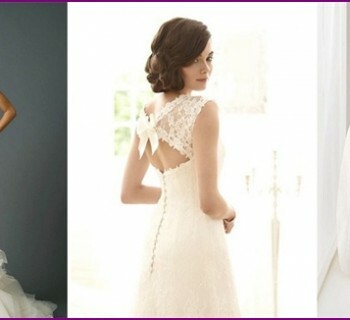 This option is a wedding dress can emphasize impeccable taste concise bride impregnated femininity, elegance and beauty. The complement color bridesmaid dress? Complete your outfit a tiny veil to match your wedding toilet. If the dress is white, the veil used by contrast, and in the tone of her chosen shoes and a bouquet. Take massive earrings on the shoulders of neutral silver. Optional accessories you do not need. If the image of wedding red hue, then try to trim neutral color shoes (beige, ivory, pale lime, and other). Use as a bright contrastingunchangeable attribute accent wedding - the bride's bouquet. Use pastel colors of fresh flowers to complement your outfit generous. Tie a ribbon on the bouquet long legs, duplicating the shape, length and color of the belt. 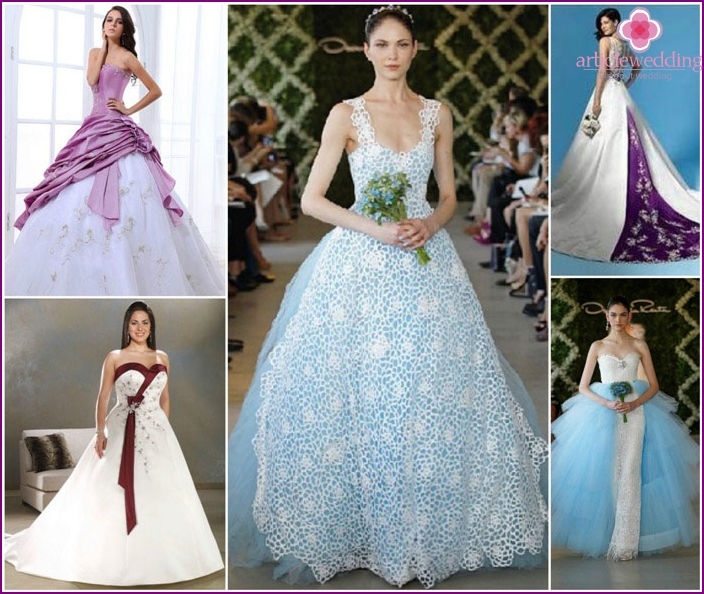 To choose your color combination is not enough toview photos of colored or white models wedding dress. Given its tsvetotip, complexion, height, hair color, you can easily pick up one of the spectacular color of dresses that offer designers in 2016. See photos, dream, fantasize and choose! Be in trend! Where can I collect the money at the wedding?